in the ordinary places of life, and trying to serve the community around us any way we can. and camping with her husband, Paul, and getting together with their grown kids. Dayle is our Deacon. Responsibilities of a deacon include assisting with worship, pastoral care and community outreach, in keeping with their traditional role of manifesting the church in the world. Bob is one of our honourary assistants. 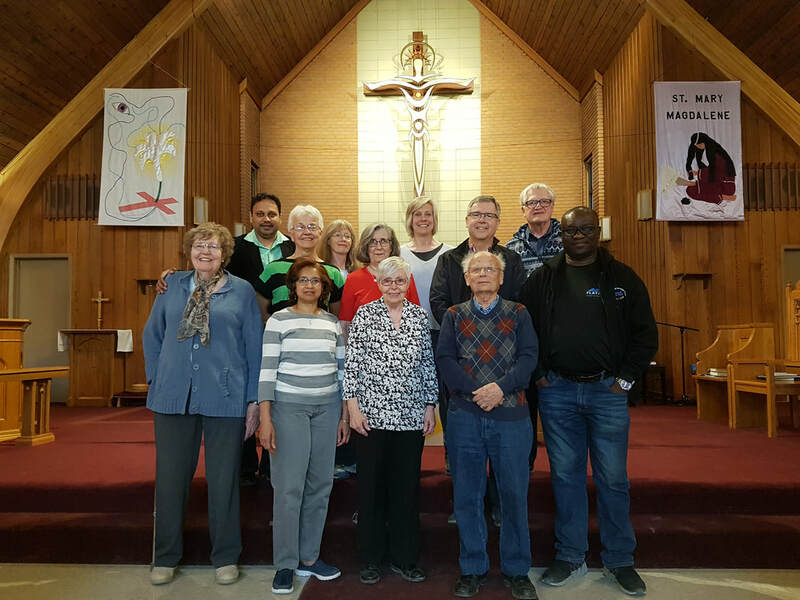 Ordained for more than 40 years, Brian has served the Anglican Church of Canada in various positions across Western Canada. He also contributed to the report on the Restoration of the Permanent Diaconate in the ACC, and participated in diocesan and national church assessment processes for persons seeking ordination in the ACC. Recently relocated to Winnipeg from Arborg, MB, Brian is a member of the Henteleff Park Foundation board, a long-time amateur winemaker, and a proud grandfather and afi of five. as well as choral conducting. She also plays guitar, djembe, ukulele, recorder and more. Nancy also owns Canada’s most successful Kindermusik studio, running 60 classes a week for children birth to age 7, including several at St. Mary Magdalene! life and independence for all Manitobans! (L-R) Front row: Heather Birtles (Deputy People’s Warden), Marlene Smith, Joan Hill, Alan Forrest, Charles Olagbuji. Second row: Shiraz Khan (Deputy Rector’s Warden), Tannis Webster (Rector’s Warden), Barbara Jalibat, Hope Bettess, The Rev. Val From, Carey Isaac, Brian Crow (People’s Warden). Missing: Abid Munir, Darryl Melnyk, Mary Jane Turner, Judy Asker.